Schneider Electric has introduced PowerTag, its smallest wireless energy sensor, designed to enhance the monitoring of electrical assets. PowerTag is built to connect to a miniature circuit breaker, to add connectivity, and to provide building owners and facility managers with precise, powerful, and real-time data to increase the health of a facility’s strategic assets. Designed for any type of building, the energy sensor easily monitors and measures currents, voltages, power, power factor and energy. This first of its kind connection enables greater availability of electrical assets by providing the ability to manage critical loads, leading to higher reliability and efficiency of the electrical installation. Data is sent wirelessly to a concentrator for display via in-built web pages, or provide data for larger energy management systems or BMS. Data can also be leveraged to create customised e-mail alarms to assist facility managers with remote monitoring of their assets. 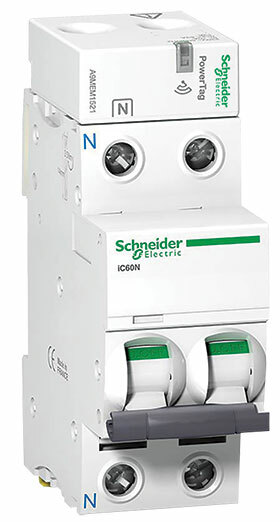 The compact, space-saving auxiliary fits easily in new and existing distribution boards and is natively integrated into Schneider Electric’s Acti 9 Communication System to provide customers an all-in-one monitoring and control solution.